Brief Description: Broadleaf weed that is sometimes used in gardens. Known for its attractive blue/purple flowers and egg shaped leaves. Wild violet is a common self-seeding broadleaf weed that is easily recognizable by its small, bluish violet flowers. They are often used as a landscaping plant, but unfortunately can also spread quickly as a weed. Wild violets spread via seed, stolons, and rhizomes so pulling the plants may not be effective. Its leaves are egg and heart shaped, and do not grow very tall. 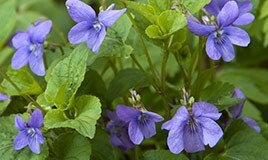 If you see young wild violet plants you can pull them out quickly after you’ve watered the soil. Violet tends to be fairly weak when it’s young, provided the soil is wet. The roots, however, are able to regrow new wild violet if any are left over, so the older the weed the harder it is to remove. Over the counter wild violet control also does not work very well. If you have wild violet in your garden, you can prevent it from spreading by using different tools between your garden and your lawn. If wild violet is spreading, it may be best to call for help. Find out more about how we control wild violet in the tri-state area by calling Green Lawn Fertilizing today.